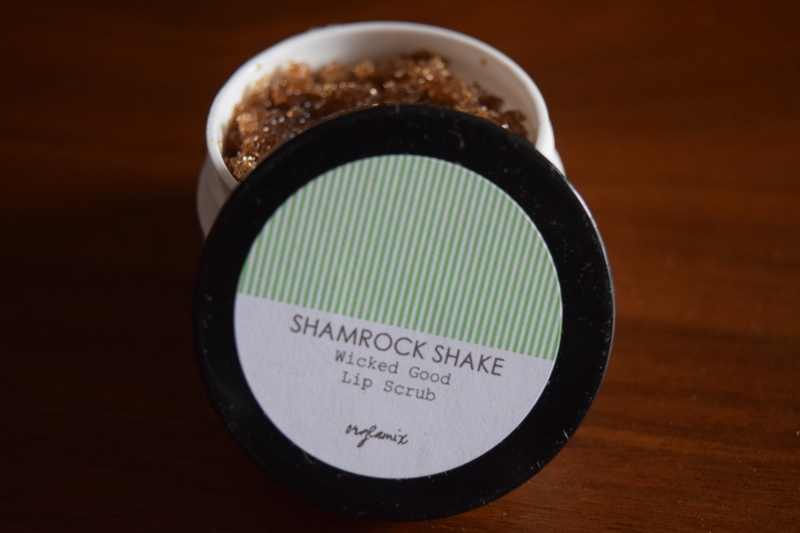 Want your beauty products to be beautiful in more than one way? 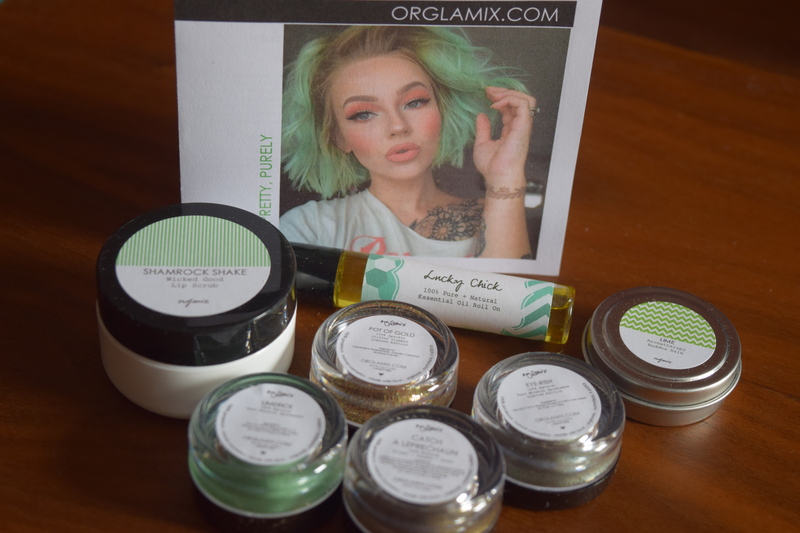 Check out Orglamix Glam Box which features vegan, cruelty free and natural beauty products. For every box sold, they also donate a meal to orphaned children in need. Who can say no to a box of makeup that helps make the world a little better? The Orglamix Glam box costs $29.00 for a monthly subscription, with discounts for prepaying. It comes with 4 – 6 products and a $10.00 gift card for use on orglamix.com. Apparently luck smells like mint and herbs. I’m not usually into aromatherapy because I’m sensitive to scents, but I applied this one when my allergies were acting up a bit to see if the mint would help me feel a little better and it actually did. The oil also rolls really smoothly from the applicator which isn’t always the case with this type of packaging. 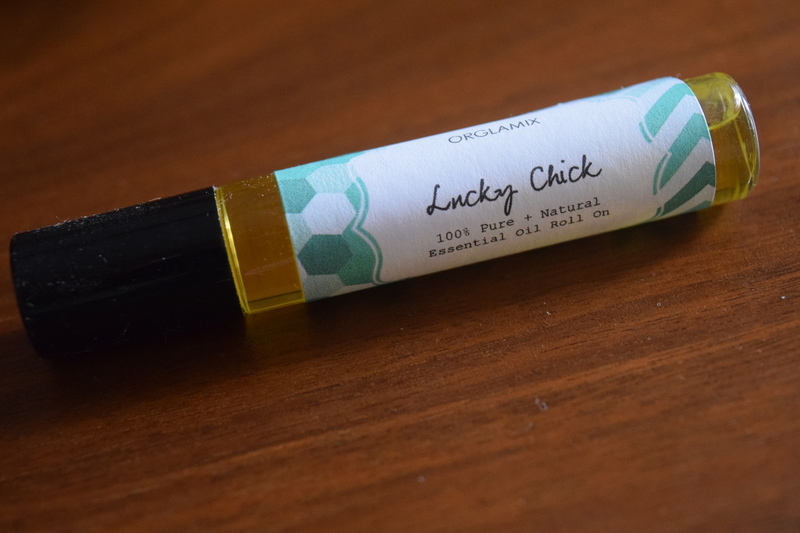 If you want to try out aromatherapy or already love it, give this brand a shot. Unfortunately I didn’t find this balm very hydrating and the lime oil additive means you shouldn’t wear it in the sun, so for a pale redhead like me, it’s not a great option. It’s not a available on the Orglamix site so it was probably a special addition for March. 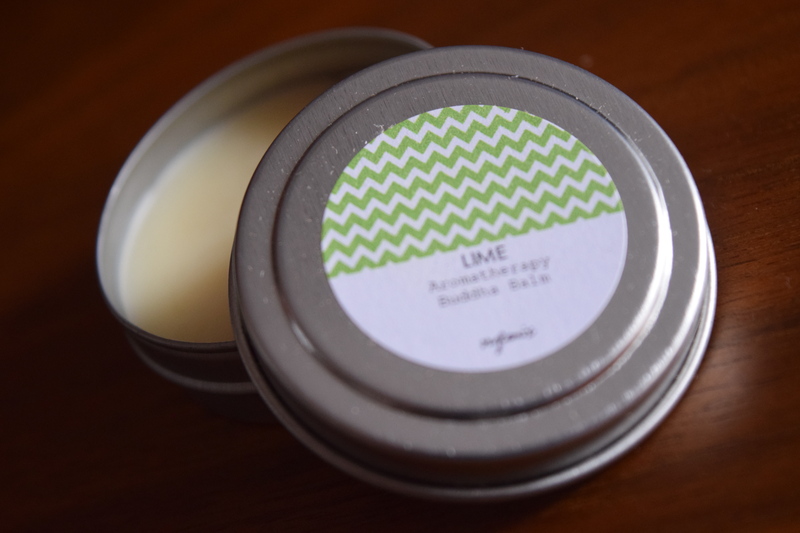 (I went ahead and linked to their other balms). Ithink I’d really like some of their other flavors including Hot Apple Cider and Red Velvet. This was obviously a special for St. Patrick’s day so it’s not up on the Orglamix site. It did have a lovely smell and the texture seemed just right for a scrub. Unfortunately I didn’t close the lid quite tight enough so it dried out before I could try it out (cue sad face). I thought it was a fun, seasonally appropriate item that had a great spa vibe to it. 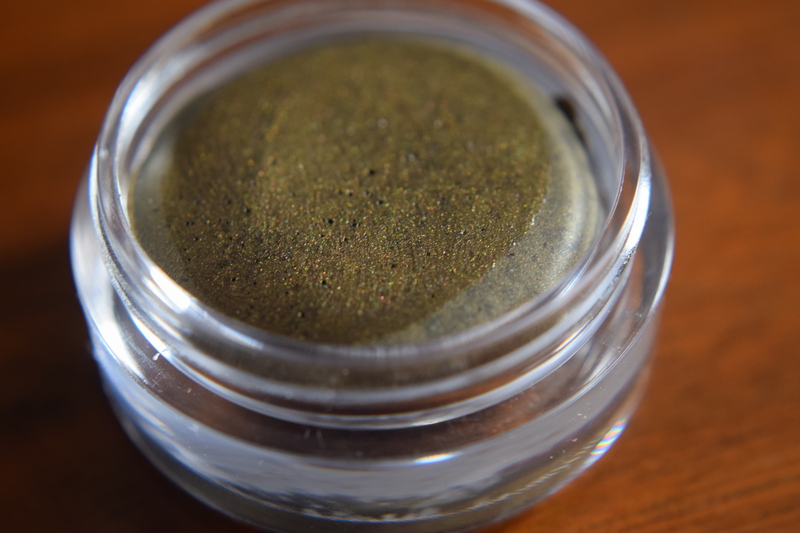 Mineral eyeshadows are wonderful for blending and these went on smoothly. I loved these seasonal shades (first two swatches above – from left to right) and think they’ll look great with my coloring. Limerick is a bit more of a highlight color, while Eye-rish is much better for every day. I know I’ll have a lot of fun with these. This is obviously not something you wear every day unless you’re Katy Perry or a stripper, but it’s still way cool. This is an item reserved for special occasions and Halloween, but it applied pretty easily and is a lot of fun. Since the box was full of other practical items, I feel like this was a fun addition and fitting of Orglamix’s St. Patrick’s Day theme. 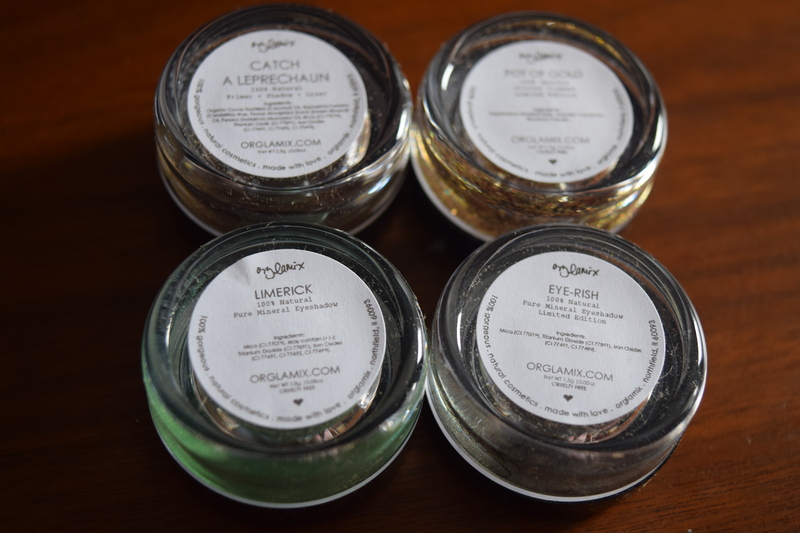 I couldn’t find this particular version on the Orglamix site, but there are lots of other glitter pigments. I used the retail price on the included card, since the other pigments are priced a bit higher. This is my absolute favorite item in the box. I love cream shadow/liner combos but they can dry out and get hard to apply and it’s actually hard to find colors that appeal to me. This shade is really funky – a great bronzey brown-green-gold amalgamation that I think would look great on just about every skin tone (swatch above on the far right). You can layer it for more color and combined with my eye primer it had great staying power. It also feels good on your lids, which is probably due to the coconut and avocado oils. Like most of the items this appears to be specially made for this box. I received this box for free, but the regular month-to-month price is $29.00 and I thought that was a great value for the products you received. If you purchased these all from the Orglamix site they’d be $88.50 and that’s excluding the fact that many of them seem to be limited edition. Natural beauty products tend to be pricier than regular ones and it can be hard to find brands and items you like. This box gave a nice mix of practical and fun items that fit the box theme. It had a sense of playfulness that was very appealing–plus each box you buy helps feed a hungry child so it’s just a win-win all around. 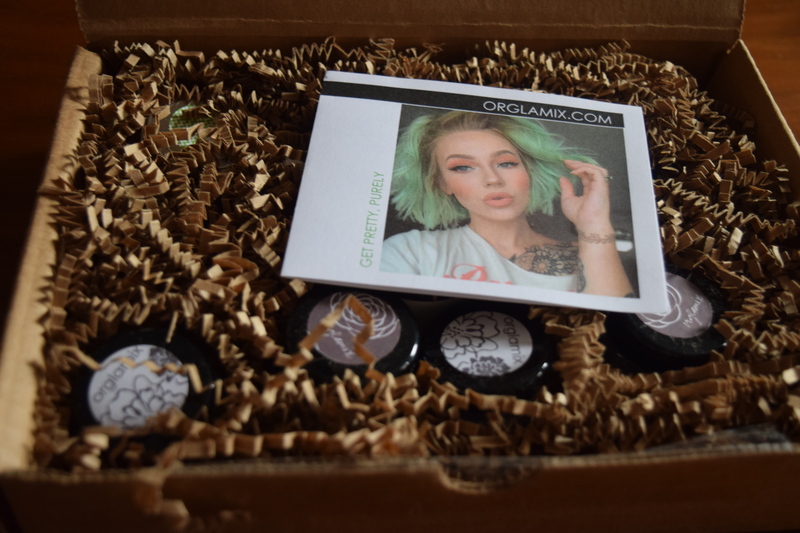 If you are looking for vegan, cruelty free makeup that’s a lot of fun, checkout the Orglamix Glam Box. How important are natural cruelty free products in your beauty routine? Are you an all natural girl, trying to slowly add in more natural products, or are you equal opportunity for all kinds of glam? Coupons: Each Month comes with a $10 gift card for Orlgmaix.com. Previous article	← Popsugar: April Must Have Mini & LE CFDA Box Spoiler!